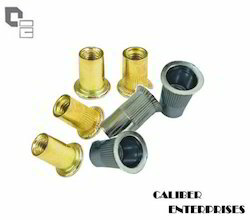 Specifications Size (Dia): M4 upto M16 / 8-32 UpTo 3/8". - Type: Round(Ribbed), Semi Hexagonal and Full Hexagonal. - Finished(Coating): Self Colour, Zinc Plated, Yellow Zinc Plated, Hot Dip Galvanized. Our expertise allows us to offer a wide range of Dual Head Inserts, which is developed at par with the international quality standards. 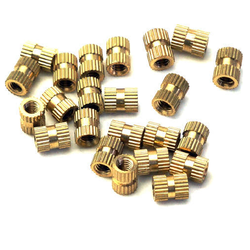 All the raw material including brass is procured from trusted and authentic vendors, so that the final product is defect free. We maintain ready stocks of D-Nuts suitable for various fixings in Wood. Range : M3 to M10 and 3/16" to 3/8"